The home of all your AIG Ireland and All Blacks news. October 2012 marked a milestone for both AIG and New Zealand Rugby with the start of a historic partnership. AIG is the Major Global Sponsor and Official Insurance Partner of the All Blacks, Maori All Blacks, All Blacks Sevens, and New Zealand Women’s Sevens, the New Zealand Black Ferns, and New Zealand Under 20s. Our commitment to New Zealand Rugby, the All Blacks, their fans, and rugby fans around the world matches the commitments we make to our customers every day. Here in Ireland we know how important heritage is to sport, which is why we have a deep respect for the rich heritage of the All Blacks jersey. Every day, we strive for teamwork, integrity, and performing at the highest level—all characteristics at the heart of the All Blacks. The strength and tenacity of our team is a common thread that links AIG and the All Blacks. No matter how difficult the challenge, these qualities inspire us to overcome any obstacle and emerge stronger than ever. Witness the electrifying Haka up close and personal in our 360° video experience. Check out our skills challenges with The Dubs, the All Blacks, Golfers and Tennis Ireland players. 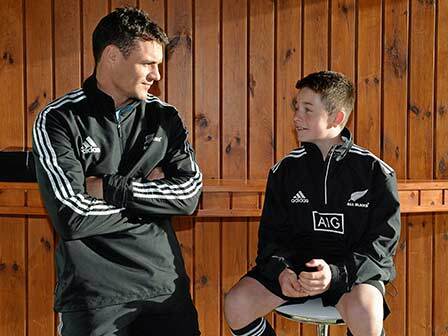 The 12-year old, who plays rugby for Terenure College caught the attention of Dan Carter in April 2012 with his Youtube video titled “Hey All Blacks Check This Out”. In response Dan posted a video to George praising his impressive kicking skills and signed off with “hopefully I get to meet you some day”. In November the following year, AIG arranged for George and Dan to finally meet. Check out the video to see how it went. In 2017, we offered the chance to win a trip of a lifetime by sending two people over to New Zealand to watch the British & Irish Lions go head to head with the mighty New Zealand All Blacks. As part of the process our finalists had to make a video to prove to us why they were the ultimate fan. You can watch the finalists videos including the winners below. AIG’s sponsorship of the All Blacks extends around the globe, and forms a platform for an exceptional opportunity to grow rugby in the global community through a range of initiatives, including here in Ireland. Our role as the Official Insurance Partner of the All Blacks is much more than a commitment to the New Zealand Rugby national teams and rugby fans alike, it is a promise for the future. 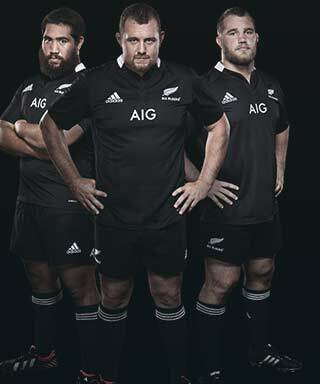 When the eyes of the world turn to watch the strength of the All Blacks, AIG is there. We are constantly striving to be at the top of our game. That’s why AIG provides great value car insurance, home insurance, travel insurance and commercial insurance.